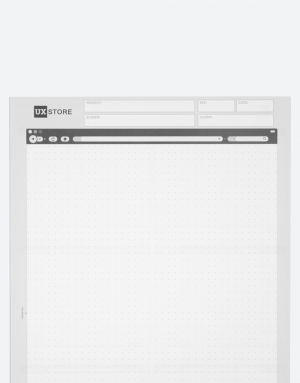 Sketch out quick iPhone and Android mobile application ideas with our Mobile Pad. This pad has three iPhone and Android silhouettes on the front side and three on the back. 300 possible screens per pad. Easily tear off sheets for review and pin-up. – Mid-size dot grid. Perfect for quick sketching using markers and pens. *For pencil and mechanical pencil sketching we suggest using our Pocket UX Sketchbook, Individual Sketch Pads & Sticky Pad which contain more suitable soft thin size dot grids.